This Heroes of Terrinoth review was made after playing the game five times. What is Heroes of Terrinoth? Heroes of Terrinoth is a cooperative fantasy game in which you play cards and roll dice in hopes of killing enemies and completing quests. It uses the same game engine found in Warhammer Quest: The Adventure Card Game, but this game is set in The Realms of Terrinoth, which is the universe used in games like Rune Age and Descent. 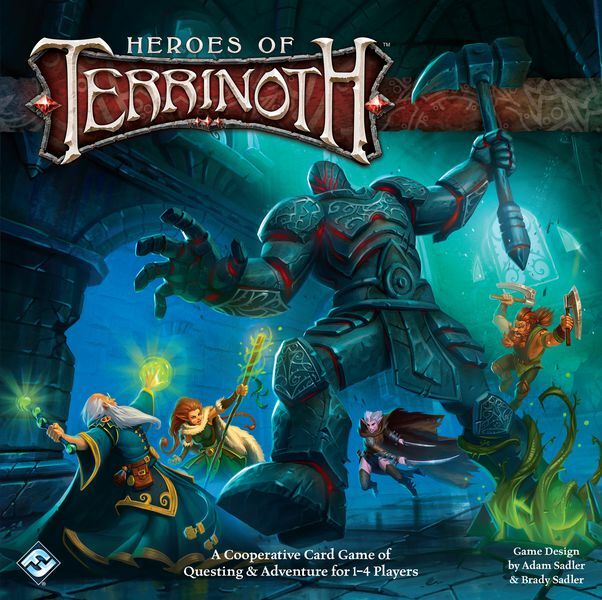 Heroes of Terrinoth was designed by Brady Sadler and Adam Sadler, and it’s published by Fantasy Flight Games. 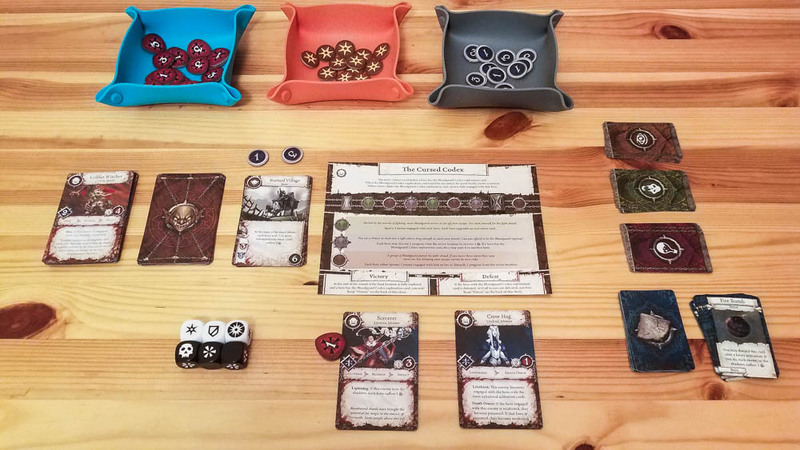 At the beginning of every game of Heroes of Terrinoth, everyone will choose one of the 18 heroes and then you’ll decide which one of the eight quests you want to go on. The quest sheet will tell you how to set up the game and what your objectives are, which usually includes defeating a Nemesis. Each hero has four unique activation cards and a special ability that they’ll be able to use throughout the game. Hero Phase – All of the players get to activate one of their cards in turn order; there are always four activations per round, so you get two actions apiece in a two-player game and one player gets an extra activation in a three-player game. When you perform an action, that card gets exhausted and can’t be used again until you “ready” it. You’re going to attack enemies that are engaged with you with the Attack action, help other heroes with the Aid action, explore locations with the Explore action, and heal yourself and ready your exhausted cards with the Rest action. You take one of these actions by activating the card, rolling dice (including dice from engaged enemies), and then resolving those dice. The hero dice have Success sides, Defense sides, and Critical Success sides. A Critical Success allows you to get one success for whatever action you’re taking and also allows you to reroll that die, potentially getting you a bunch of successes. The enemy dice have Counterattack sides, Threat sides, and blank sides. Counterattacks allow the enemies engaged with you to deal damage, while the Threat sides activate the Nemesis’ abilities. Enemy Phase – Every enemy has an effect bar on its card and those effects activate in order during this phase. Some enemies will engage and then attack, some will attack and then move back into the shadows, and some can even attack, move, and then attack again. Peril Phase – Every quest has a peril track that will tell you what happens during this phase. Usually bad things happen, but this is also when you might have the opportunity to upgrade your activation cards. When you upgrade a card for the first time, the card you choose will determine the class that your hero will be for the rest of the game, meaning that all of your future upgrades will also be for that class. The new cards replace the basic cards. Travel Phase – Every quest has location cards that you’ll be traveling to and exploring. During this phase the current location card’s ability will usually activate and you will have the chance to travel to the next location if you’ve explored it enough. Every time you travel the enemies engaged with you will follow you to the next location, but the enemies in the shadows won’t. The Success tokens that you can get from Aid actions and other abilities in the game allow you to add more successes to whatever you roll on your turn. You’re allowed to hold up to five tokens and you can choose to use up to two of them every turn. Most of the time you’ll be focusing on figuring out which enemies you should be engaged with and which actions you should take each turn. Sometimes it’s best to explore and take some damage from the enemies in front of you, while in other cases you might want to use your attack action and clear out some of those enemies. Timing your actions is extremely important since you’ll usually have to use your Rest action to be able to take your best actions again in a future round. You’ll also want to think about when you should travel since you don’t want too many enemies following you to the next location. There are “Victory” and “Defeat” conditions on each quest sheet. You might have to explore all of the locations and defeat the Nemesis to win, or you might just have to survive until you make it to a specific spot on the peril track. In most cases you’ll lose if all of the heroes are defeated. The heroes in Heroes of Terrinoth only have one special ability apiece, but those abilities do make you change up how you play each game. For example, if you have Ashrian the healer, you can regularly engage the toughest enemies because she has the ability to exhaust them before they’re able to activate. Choosing upgrades is probably the most exciting part of this game. Sometimes you’ll choose based on what’s currently going on in the quest, while in other cases you might just pick your favorite upgrade. There is plenty of cooperation in Heroes of Terrinoth. Not only do you have the Aid action that allows you to give teammates some success tokens, you’ll also often be working together to take down the tougher enemies. For example, you can engage an enemy and attack them, and then another player can engage them and finish them off. There is a good amount of replay value in this box. There are plenty of heroes, you can upgrade your heroes in different ways, a lot of the quests have you put random enemies of different difficulty levels into the enemy deck, and, obviously, the dice results will force you to adjust. I like that every enemy ability that isn’t a common ability is explained right there on the enemies’ cards. The game scales well thanks to the extra actions and added health you get when playing with fewer than four players. Games are pretty quick yet they still feel like complete adventures. I’ve played the game at all player counts and none of those games lasted longer than an hour. Heroes of Terrinoth has one of my favorite box covers. Those blues really pop! I’ve played two of the three easy quests and they were way too easy. We barely took any damage and they just weren’t exciting games. It’s good to have some easier scenarios in games like this, but I don’t think that they should ever be auto-wins. It rarely feels good to take the Rest action, especially in four-player games since that’s all you’ll be doing during the round. I wouldn’t call those “dead” turns since you do usually get a useful ability out of it, but you’d definitely rather be doing something else. I like that all of the quests can be played as one-offs, but it would have been cool if they found a way to link them together in some way, maybe as three-quest campaigns. Hopefully they do something like that with future expansions. Quarterbacking is a potential issue in this one. Since every bit of information is out there for everyone to see, an alpha player could attempt to take over. Heroes of Terrinoth is only slightly different than Warhammer Quest: The Adventure Card Game mechanically, but I really like the changes they made. I like that all of the quests were designed to be played as one-offs and that there are more characters and enemies in this game. Oh, and I really like that they changed how the Success tokens work, allowing you to use them for any action rather than having to place them on an action card when you get them. 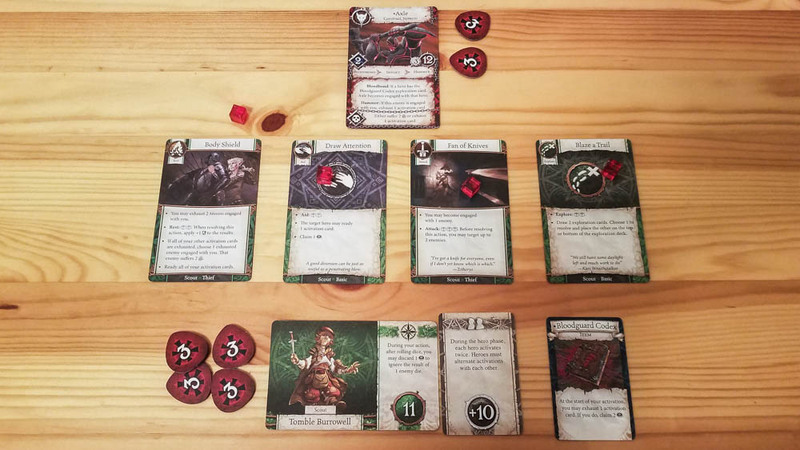 If you didn’t enjoy Warhammer Quest: The Adventure Card Game, chances are you won’t like Heroes of Terrinoth either since the two games are so similar. Even if you prefer this theme, it probably won’t be enough to make you like the game. If you’ve never experienced this game system before, I’d recommend Heroes of Terrinoth if you like dice rolling games, fantasy games, or if you really like this theme. It’s easy to learn, you can get through each quest pretty quickly, and it plays well at all player counts. For now, I like having Heroes of Terrinoth on my shelf as a quick-playing alternative to The Lord of the Rings: The Card Game. 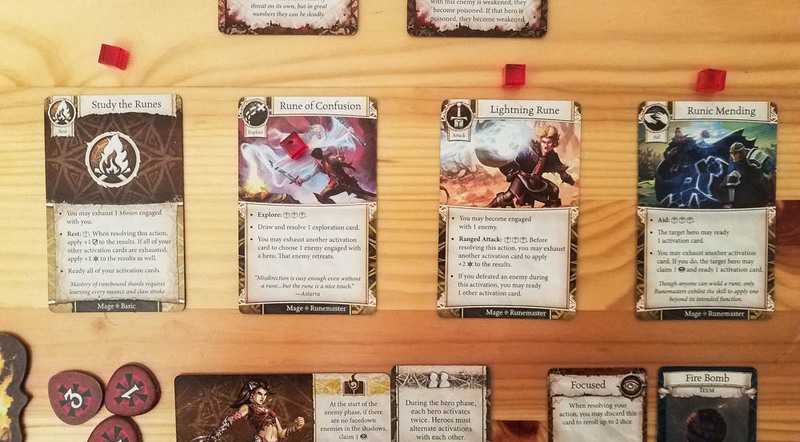 Sure, there’s no deck constructing in Heroes of Terrinoth and The Lord of the Rings doesn’t have dice, but they do feel like similar games to me. When I’m not in the mood to build a deck or I know I’m going to have more than one other person playing, Heroes of Terrinoth will be a great fantasy option to have. Thanks for taking the time to read our Heroes of Terrinoth review! To stay updated on all things cooperative board games, follow us on Twitter, Facebook, or via RSS.